My next two flights (in successive weeks) involved business flights up to Petaluma to visit my clients at KG Technologies. You might recall that it was my flights to KG last year that made me begin to realize that my dream of having my own company and flying myself to business meetings wasn’t far from reality. Now, a year later, I was realizing that dream. 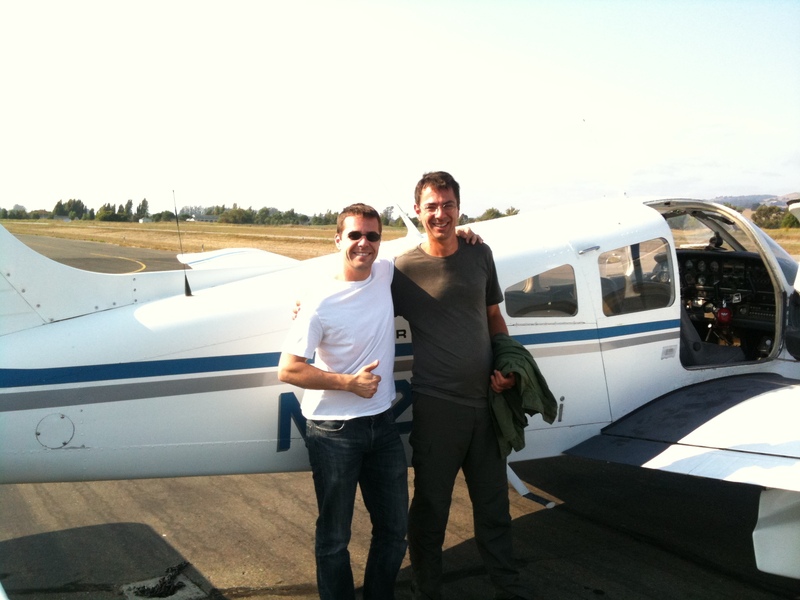 Thankfully, I also had the chance on one of those trips to extend the hand of aviation to another couple of non-pilots, Philipp and Wolfgang. Philipp, my college roommate and now Chief Executive of KG Technologies, and his brother and fellow Chief Executive Wolfgang, have flown over all the world on airliners and even some small passenger aircraft. Yet, neither had ever flown in a 4-place general aviation aircraft. So before heading back home, I seized the opportunity to take them on a quick 20-min flight above the skies in the Petaluma area to see their office and their home from the sky. While, I most say this short flight wasn’t one of my best, I really had to use a lot of my skills to ensure a safe flight. We couldn’t fly any further north than their office location, since the visibility began to drop drastically. And given the late afternoon rapid pressure changes in the area, the winds were causing the flight to be a bit bumpier than usual. Yet, in the end, they both enjoyed the flight and I was able to add 2 more people to my list of non-pilot passengers.